Winrock International manages a portfolio of more than 100 agriculture, environment and social development projects in over 40 countries. It has annual revenue of $100 million, employing over 1,000 staff around the world managed from five Winrock offices and dozens of project offices. Winrock also manages a $50 million investment reserve, leveraging the proceeds of that fund almost 30 times every year. 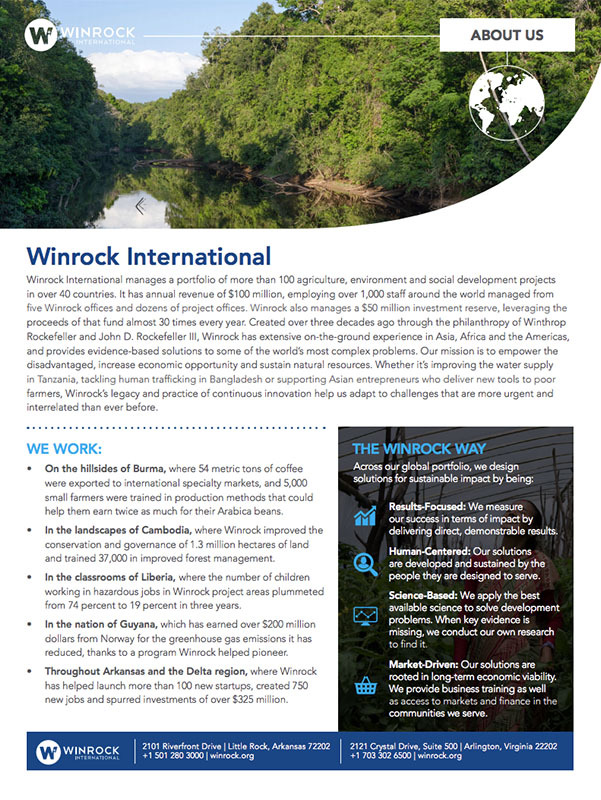 Created over three decades ago through the philanthropy of Winthrop Rockefeller and John D. Rockefeller III, Winrock has extensive on-the-ground experience in Asia, Africa and the Americas, and provides evidence-based solutions to some of the world’s most complex problems. Our mission is to empower the disadvantaged, increase economic opportunity and sustain natural resources. Whether it’s improving the water supply in Tanzania, tackling human trafficking in Bangladesh or supporting Asian entrepreneurs who deliver new tools to poor farmers, Winrock’s legacy and practice of continuous innovation help us adapt to challenges that are more urgent and interrelated than ever before.